In a wok or large pan heat a little oil, add the chicken sliced and stir fry for 4 or 5 minutes until the chicken is white. Now add the curry paste, garlic, ginger and lemon juice and stir fry for a minute or so to combine the flavours. 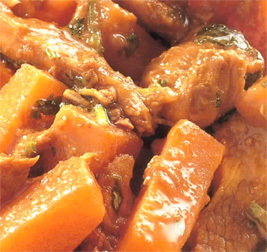 Add the sweet potato pieces and coconut milk, bring to the boil, reduce to a medium heat and simmer for 15 minutes. Add the tomatoes and simmer for a further 5 minutes. The sauce should be thick and reduced and smell incredible. Delish! On the stove cooking and can’t wait for sups later! I made this last night and it was fantastic! I used butternut instead of sweet potatoes, and it was delicious. I’m very keen to try it with the potatoes though – apparently it’ll be even better! I would like to try this recipe but have never used red curry paste. I know where to buy it but am hesitant as it might be too strong for my palate. I prefer a medium curry flavour. Please advise. Looks delish!! How come your sweet potatoes are orange? I see that a lot on BBC Food but have never come across one when shopping. Is there a difference? At which point should the chopped coriander be added? I cooked this last night to rave reviews and guessed at tossing the coriander in when I added the tomatoes. HI GRAHAM.THANX FOR THE LOVELY RECIPES.PLZ LET ME KNOW WHERE CAN OBTAIN THE RED THAI CURRY PASTE??? ?